October has been a great month for iOS app development-related books: iPhone App Entrepreneur by David Appleyard and App Savvy by our friend Ken Yarmosh are two of the best pieces anyone interested in getting started with iOS development (or anyone interested in iOS, period) should read. November brings another great book with it, this time tailored to Mac users who have found their productivity setup in OmniFocus. 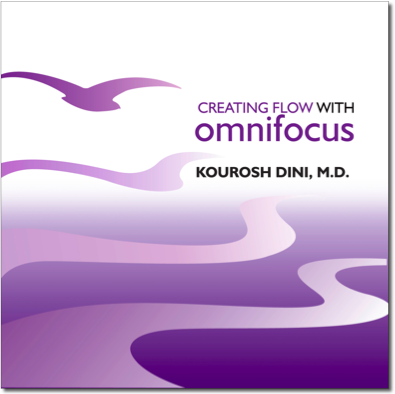 "Creating Flow with OmniFocus", written by Kourosh Dini, MD – "a Chicago based psychiatrist, musician, author, husband and father who also happens to really enjoy technology" - is the ultimate resource that covers OmniFocus from the very first steps (setting up new projects and contexts) to advanced functionalities such as the much popular and loved Perspectives. Perspectives are aptly named as the term refers to an angle at which tasks and projects may be viewed. In a sense, one’s workload is a large single entity within OmniFocus that can be taken apart, examined, and adjusted. How this work is best tackled is up to the user. Do you have a lot of time? A little? Where are you now? Mastering the use of perspectives will provide the best methods towards not only deciding what and where to begin, but also getting to a list that reflects the present state with as little fuss as possible. I don't want to spoil the contents of this book, so let me just say that I've been impressed by Kourosh's attention to details, app preferences and user cases -- a kind of attention that's hard to find in most OmniFocus manuals and "in-depth" online resources. This is a book for every kind of OmniFocus user, casual and pros, new users and experienced ones who, maybe, didn't really dig in all the available features. With lots of screenshots, suggestions and tips, Pomodoro implementations within OmniFocus (really, awesome stuff) and considerations on people's approach to productivity and task lists, Creating Flow with OmniFocus is a must-have for every OF user. I don't know what else to say about it -- it's simply a great book. So head over Using OmniFocus' website, download a free preview and browse the huge "Resources" section with tons of great OmniFocus-related links then go buy it at $29.95. Or if you'd like to wait until tomorrow, we're giving away two PDF copies of the book. Check out the giveaway rules below. We will search Twitter.com for tweets and retweets and randomly pick up the winners. Make sure to follow @macstoriesnet on Twitter so we can send you a direct message with the promocode of the app you won. If you want to increase your odds of winning, you can also leave a comment to this post. Tell us why you’d like to win a copy of Creating Flow with OmniFocus. Winners will be announced tomorrow (November 3rd).